All of our services emphasize individual attention, with an exceptionally high level of personalized service. To ensure the best possible opportunity for personal interaction, our programs take place exclusively in individual or small-group settings. We do not accept more than three clients per guide  most of the time we work with just one client, or occasionally two clients, at a time. Adhering to these standards, we have operated year-round, on a full-time basis, in the Adirondacks and around the world, since 1985. The Our Values section of this site presents the principles that govern our programs and business, and the passions that draw us to the mountains. To find out more about our qualifications please visit the About Us section. In each of our activity areas, Rock Climbing, Ice Climbing, Mountaineering and Backcountry Skiing, we offer a range of instructional opportunities for beginner through advanced levels. The Alpine Mastery Methods, our comprehensive teaching systems, were designed to maximize your learning time and allow you to acquire the knowledge and skills required to become the very best alpinist you can possibly be. 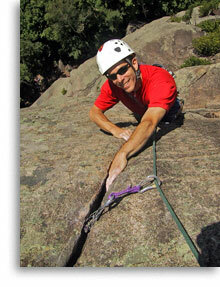 In the Adirondacks we provide guided climbing and skiing for all ability levels. 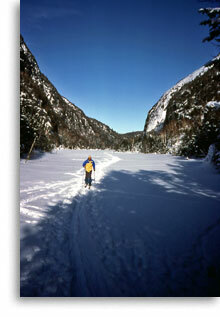 The Adirondack Mountains are a truly vast resource, offering a lifetime of mountain adventures. 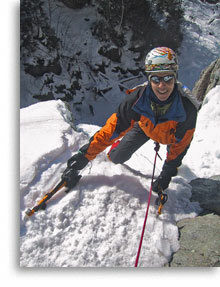 We also arrange trips for experienced alpinists, on a private basis, to mountain destinations throughout the world. We offer consulting services for outdoor program design, evaluation, and administration  and we can provide expertise in more technical areas such as climbing safety practices. Please contact us regarding the scope of our services and how we might best serve your needs. How Difficult Are Our Programs? You needn’t be a super-human combination of muscle and courage to experience the joys of alpinism. Most of our programs are designed for active people who are in good to excellent physical condition. This doesn’t mean that you must be in the habit of running several miles a day, but you should be getting some kind of strenuous exercise regularly. Our programs are not “stress-challenge” in nature. We will not intentionally push you to your limits and beyond but, at the end of one of our programs, you should expect to feel the warm, tired glow that follows a mountain adventure. Some of our programs require certain skills as prerequisites, or are particularly demanding. Please refer to specific program descriptions to determine which are appropriate for you  or feel free to contact us to discuss the particulars. You may also wish to visit our Fitness & Training page. We try very hard to match the difficulty of our programs to the skill and confidence levels of our clients. If you are unsure about your fitness or technical skills it would be our pleasure to help you determine the best program. Safety is always our number one priority. You can’t learn if you’re afraid so when we teach the use of safety equipment and techniques we make sure you understand how they work and why they work. Rather than overloading ourselves with superfluous gear we foster an attitude of true safety through informed decision-making and realistic self-assessment. This emphasis on good judgment provides a far greater margin of safety than equipment alone can. Moreover, our low client to guide ratios allow us to give our full attention to you. We believe all alpinists, not just guides, should be well-versed in safety techniques and this attitude is incorporated into all of our programs. 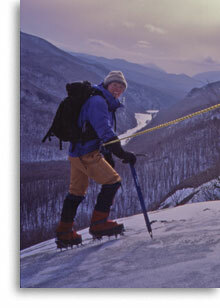 When we started Alpine Adventures, the mountain guiding industry consisted of a small handful of devoted professionals. Over the years, the industry has grown enormously and you will find a wide variety of companies offering an even wider variety of services. Some of these companies are still committed to excellence, but others are quick to forego quality in the interest of profit. To help you make an informed decision when purchasing mountain guiding services, we have prepared a list of concerns you might wish to consider at Comparing Guides, Guide Services & Climbing Schools. Many factors will enter into an informed decision, including a company’s experience, qualifications, prices, availability, and the level of services offered. It is essential that you clearly understand what is available, your own needs, and what is being offered before you can assess the value of any program. Keep in mind that there is no single credential that will guarantee you a quality experience  be especially wary of anyone who claims to have one.